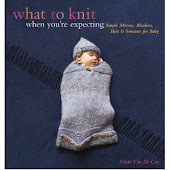 What To Knit When You're Expecting: How many times can you knit a hemline? How many times can you knit a hemline? This took me a few tries. Also I couldn't get it to hang on the hanger without looking crooked, though I swear the sweater itself is straight. This is the Leni Sweater, it's knit in Spud & Chloe Sweater, on US 7 needles, so it's very, very cozy, and I love it and it's beautiful, but I have a confession to make--I hate designing with stripes. 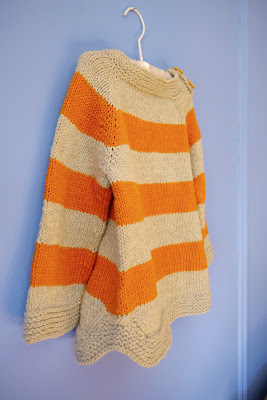 I really like stripes, and this sweater, with a great deal of finagling, came out just how I wanted it to, but the problem with stripes is that unless you're making just one size, the stripe pattern is just not going to be your friend. My solution is to make narrower stripes per size, because despite how I purchase sweaters in stores, when I'm knitting them it really, really bothers me to interrupt the stripe and just finish it off right there. You know what I mean? You can see I gritted my teeth and did it anyway on the sleeves, because sleeve length is just not forgiving enough, whereas I can say "It was meant to be a tunic for 3T! It's a little less of a tunic for 4T, but totally a tunic again for 2T!") because I think the sweater looks good either way. But. Stripes are persnickety. And they're not very nice about it. They say, "you only have so many rows to work with, lady, so if you don't want to put a buttonhole in the middle of a color change, you'd better make your stripe reeeaaallly wide there, or give up a buttonhole. Your choice." But the stripes weren't even my biggest problem, by the end. My biggest problem was the notched hem, and I absolutely positively was going to put in a notched hem, it was all I wanted in the world, a notched hem and a button or two at the collar. Doesn't seem like that much to ask, right? But getting that hem to stay notched once I knit on the garter edging, and not smooth itself out into a gentle little anthill instead, was in fact something of a challenge. And I apologize to anyone who will knit this sweater someday, as it has seemingly random increases and decreases tucked all in that garter edging, but I assure you they are not random and are in fact the result of careful knitting and reknitting and cursing and reknitting again. It worked, by the end. 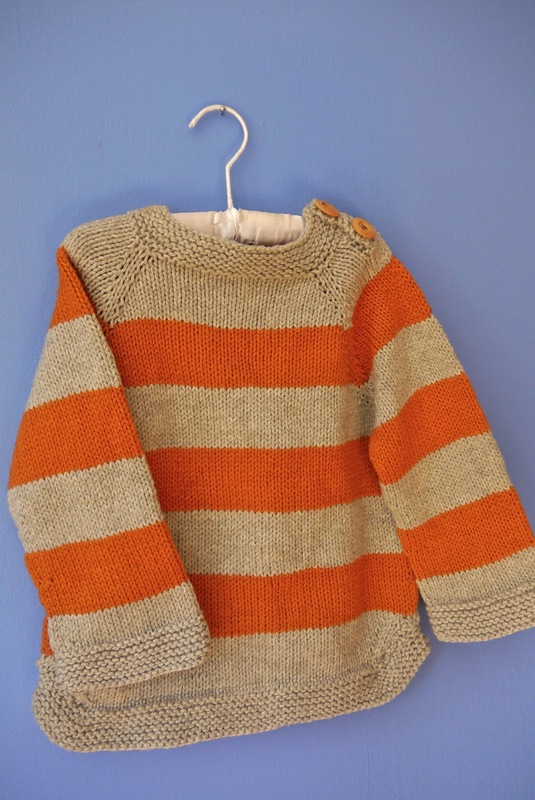 It was just a very long road to a very simple (looking) sweater. 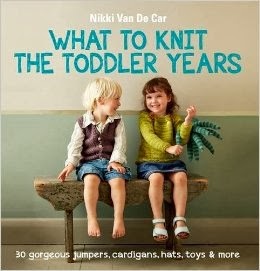 Looks like all of the knitting and re-knitting was worth it. Really cute sweater and love the hem.